The Paravento side awning protects against inquisitive glances, sunlight and cool side winds. As a cost effective solution, the lean but robust cassette can be mounted practically anywhere. A Paravento awning creates an attractive patio highlight in combination with a striking pattern from the extensive fabric collection. Special function fabrics provide privacy protection and allow an outside view during the day. The Paravento is a flexible and elegant alternative to fixed elements such as fences, walls and hedges. 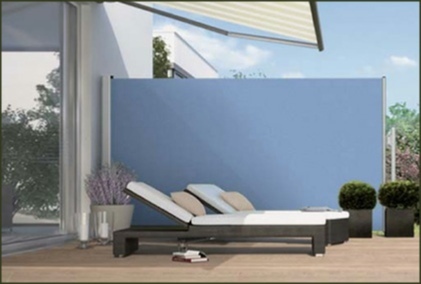 The Paravento awning can be fitted easily to any house wall or patio construction. It extends simply and quickly due to the corresponding attachments. With trapezium shaped fabric a Paravento is the ideal complement to an existing awning, as its shape corresponds to the angle of inclination. When retracted, the Paravento awning is concealed completely within the stylish aluminium cassette.